While writing the posting for this chapter a thought came to me, perhaps it's another Aphorism! It goes like this. It is important to have passion for what you write and to write with passion. I think there is a difference. Cecil shares how he turned down a writing project from a wealthy entrepreneur that would have given him a considerable amount of money and guaranteed work for some time, but he turns the job offer down. Why? As Cecil puts it "I felt no enthusiasm. No conviction. His book ideas were topics on which I probably had only a mild interest. Although none of the ideas went against my sense of integrity, I had no strong feelings to pursue them. That question of zeal or passion was the deciding factor." I don't about you but I find that to turn such an offer down admirable. It would be hard to be enthusiastic about topics you can't relate to. No amount of money would change what is not in your heart. You might be wealthy, but you might be miserable too! Cecil also shares how conviction and energy come from within. That our fervency (or lack of it) shows, whether we are writing about investing in stocks, historical fiction, or how to build a fabulous wardrobe on a budget. 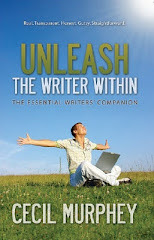 He says, "To write passionately, we need to "catch fire" as one writer put it. We need to be carried along by something stronger than our normal self." When we are considering writing a book on any topic Cecil's advice to us is to check our feelings. He says, "Ask yourself, can I stay excited about this for nine months or a year?" This topic on passion really tugs at my own heart for the very reason that I to need to feel passionate about the subjects I write. I have to write from the heart. It's just who I am and although there is much room for improvement with grammar and basic skills in my writing, I know that I know writing is what I want to do. It's like a calling. I have my career which is my day job but my writing is my passion. Perhaps one day the two will become one in the same! Cecil says that writing passionately fulfills certain inward demands. If you don't find pleasure in typing the words and thoughts, you're not writing from passion. He writes, "When you write, you probably start with what you've thought about, know, or you've researched, but that's not where fervor enters the process. Passion flows when you discover what you didn't yet know. It's like finding a wrapped gift at your front door with your name on it, and you can hardly wait to open the box." Cecil shares how he writes for self-discovery, and that the writing doesn't have to be subjective. He mentions that he liked how one woman called writing an excavation. "If writing is excavating, you learn deeper meanings, and the intensity increases through the simple act of tapping the keyboard." Another thought just came to my mind as I read Cecil's comments from this previous paragraph. We grow word by word, line by line, tapping and digging as thoughts come to mind! Wow, my creative juices are really on a roll tonight! The Aphorism for this chapter is: "I am a passionate person. I can be a passionate writer if I choose." Aphorism # 26: "I am a passionate person. I can be a passionate writer if I choose."